Hearing our children begin to speak and form sentences can be a very exciting thing for a parent! As these moments start happening we see our children begin to gain independence and feel that we can almost see our child’s wheels “begin to turn” as their thought processes form! Of course there is no magical age that children achieve this milestone, we typically see this begin after their first birthday. 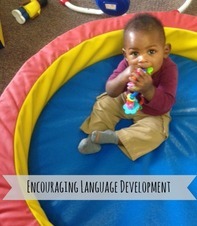 As parents and caregivers there are some things we can do at home to encourage this language development that is key to a toddler’s development. When we ask children questions or comment on an action they are doing we must allow them time to respond. As adults we sometimes ask a child a question such as “what are you doing?” and then answer it ourselves if it takes them longer than a few moments. Patience is key, if a child learns that they do not have to speak for themselves because an adult always does it for them they will not continue to try. Taking time to sit down and narrate while your child is playing can be very effective. Try to see each situation as an opportunity for language. As your child brings toys out to play phrases such as “good morning white teddy bear” will catch their attention as well as “let’s stack the yellow blocks on top of the blue blocks!” You will only be explaining the play that they are already doing and encouraging them to repeat back to you. As children begin speaking with basic words expand on their language; if they say “grape” reply with “yes, that’s a green grape. Most importantly – read, read, read! And sing. And then read some more! Did you know that words and sounds heard by a child before the age of three have the most potential to be remembered forever? When we sing to children we expose the phonetics of words in new ways as well an opportunity to be silly! The more we introduce our children to different sounds and words the greater potential they have for a vast and long term understanding of language! Are you wondering if your child is on track with their milestones? Chat with the staff at your Valley Child Care program or check out our Pinterest board here!